The promotional credit will expire on January 23rd, so it would be prudent to find a movie, rent it with the code, then watch it at your leisure - the movie doesn't begin to expire until you start watching, and you have 30 days to do so. There doesn't appear to be any limitation on the discount: it can be applied to any movie available for rent, standard definition or HD. If you're using the Amazon website, follow these precise instructions to redeem your credit (sometimes the settings can buy the rental without applying it). Don't click "confirm purchase" if it appears in a green button. Click "redeem a gift card or promotional code." Type the MOVIE99 code into the field, then click "Apply." Now go back and click "Rent Movie," then "Confirm purchase." The site will say you've paid $4.99 (assuming it's the standard HD price), but your email receipt will show the discount down to 99 cents. 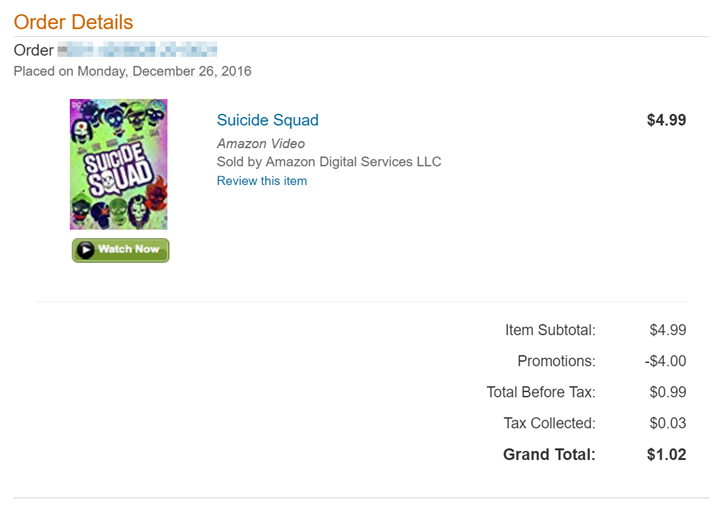 Far be it from me to tell you what to watch with your movie credit, but I'll take the opportunity to see about the alleged train wreck that is Suicide Squad for a song. Other recent additions to Amazon's catalog worth considering are Jason Bourne, Snowden, Don't Breathe, and Kubo and the Two Strings. For holiday movies I'm partial to the 1984 version of A Christmas Carol with George C. Scott (or the Muppet version if you need to keep the attention of the kiddies), or for the all-time classic, It's a Wonderful Life. I know a bunch of you haven't seen it, because no one laughs at parties anymore when I say "Merry Christmas movie house!" The traditional holiday action movie is Die Hard, of course, but I prefer Kiss Kiss Bang Bang: also about a put-upon New Yorker in LA, also has plenty of foul language and shootouts, and also takes place at Christmas.